Greywaren Art: Carytown Series Underway! 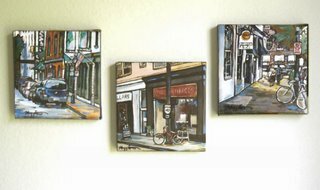 The first half of the Carytown Series is finished and on eBay! Each of these little pieces is a lot of fun and presents a unique set of challenges -- it's a small space to paint on effectively. I really felt like I was channeling Carytown, though (is that how channeling is spelled? ); it was so easy to remember standing right on that spot and taking that photograph. 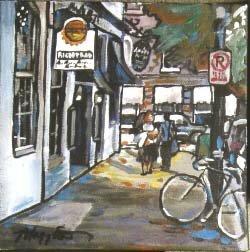 Not so much with the first one, which is in Carytown proper, but with second two, I definitely had a pile of memories that came back. 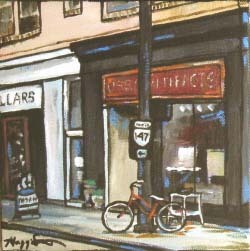 I liked the image of the lone bicycle in this one, sitting in front of an attractively cluttered antiques store. This image is full of memories for me. Right down there on the corner, where you see the black sign, is a restaurant called La Grotta. It's a beautiful little Italian restaurant, not for the faint of wallet, located beneath Richbrau. It's dark and intimate and the food is wonderful. Save room for dessert. Believe me. This image holds perhaps the most memories of all for me. 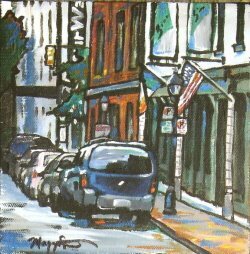 When I was in college just four or five years ago, I started an Irish band called Ballynoola (our most loyal of fans may still remember us and play our CD) and we toured all around Virginia and Maryland. One of our gigs was in front of this Irish restaurant, Sine, in honor of their grand opening. It was Halloween and everyone walking by us was in costume. I remember in particular Princess Leah (is that even how you spell her name? I know some Star Wars fan is going to be irritated with me) walking by holding her baby Yoda in her arms. Good times!